Hagen in Westphalen, 25.02.1873, Aktie über 200 Thaler Preuss. Courant, #1463, 25,2 x 36,3 cm, ocker, schwarz, fliederfarben, Knickfalten (geviertelt), Erhaltung VF+, Faksimile-Signatur als Aufsichtsrat Rechtsanwalt Storp aus Hagen, Christian Diedrich Killing und als Vorstand: Wilhelm Köppern (der Vater des Gründers der Maschinenfabrik Köppern GmbH & Co. KG), Einzelstück beim Einlieferer, bisher völlig unbekannt. Hagen in Westphalen, 25 February 1873, Share certificate for 200 Thaler Preuss. Courant, #1463, 25.2 x 36.3 cm, ochre, black, lilac, folds (quartered), Condtion VF+, facsimile signature of attorney Storp from Hagen as member of the supervisory board, Christian Diedrich Killing and Wilhelm Köppern (father of the founder of Maschinenfabrik Köppern GmbH & Co. KG) as director, the seller’s unique piece, unknown before. The Killing family from Selbecke (nowadays a district of Hagen) played an important part in the company’s history. There, Caspar Diedrich Killing (“the Elder”) kept an inn and operated a bakery. In Delstern his two sons and Dr. Carl Killing founded a factory for incandescent light bulbs running on gas. The second oldest son – also named Caspar Diedrich – had learned forging and together with Bernhard Diedrich Rath he took over the company from Christian Söding. At the river Ennepe’s junction with the river Volme they started manufacturing anvils, later also nails, screws and other small ferrous items. In 1863 Bernhard Dietrich Rath left the partnership. Killing’s son Friedrich took his place and the name was changed from Killing & Rath to Killing & Sohn (Killing & Son). In 1868 father and son began building railroad cars. In order to finance further expansion the Waggonfabrik Westphalia headed by Heinrich Quistorp was founded in 1872. Apparently Killing and Quistorp worked well with each other, because they are also mentioned as founders of Germania Eisenbahnwagen-Leihanstalt as well as Waggon- und Locomotivenanstalt vormals Killing & Co. in Hamm in Otto Glagau’s book „Der Börsen- und Gründungsschwindel in Berlin“, which is probably the best known publication about fraudss in the 19th century stock market. 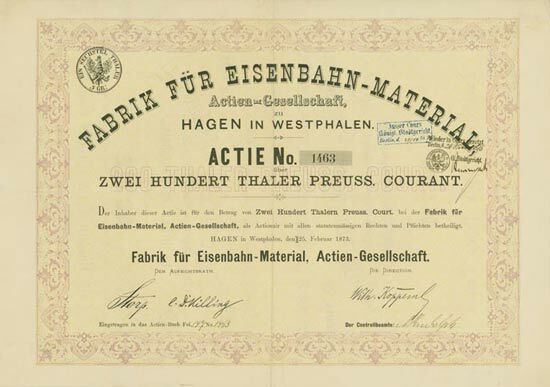 Further it seems that they also founded the Fabrik für Eisenbahn-Material: Anyway Caspar Diedrich Killing signed the certificate as a member of the supervisory board. Killing’s main business, Waggonfabrik Westphalia, had to file for bankruptcy in 1875 – but he bought the factory back out of the bankruptcy assets. After some time this factory was merged into Vereinigte Westdeutsche Waggonfabrik (Westwaggon, Köln-Deutz), and later it became part of Klöckner-Humboldt-Deutz (KHD).